Muskrats can cause a lot of damage to your yard and the water banks around your property. Muskrats eat vegetation and plants so if their resources begins to dwindle around their homes near the water, they will begin to venture away from their burrows in the search for food. If you have a garden, flowers, berries or anything that is eatable to them, they will start making regular visits to your yard. Muskrats can utterly devastate your gardens which can be a really big problem if you have a show garden or use your yard to grow food. The other thing that muskrats can do is disrupt the water flow in an area if they build their home on the side of a dam. They can also weaken the sides of a water bank which can cause it to collapse on the muskrat or you if you put too much weight on it. If you have muskrat problems here are some do it yourself tips to get rid of them for good. The first thing that you want to do to keep the muskrats from entering your yard is to make sure that they cannot get in your yard. A fence is a very effective way of doing this. If you cannot afford to fence your entire property, then you can just build a fence that surrounds your garden or the other areas that the muskrats are getting into. If you build the fence so that it extends at least a foot underground and a few feet above ground you can rest assured that the muskrats and any other animals that are dining on your vegetation cannot get in. Trapping the muskrats is another option that is available to you. You can buy live or lethal traps online, in garden or hardware stores or you can call down to your local animal control agency and ask if you can rent one. However, you must check to see if it is legal to trap muskrats in your state or if you have to have it professionally removed, as it is not legal in every state. Set the traps down by the water bank by their burrow or in an area that they frequent a lot. Check the traps everyday and once you have caught them, you will have to relocate them at least 10 miles away from your home. Many people try to poison muskrats, but this is one of the worst things that you can do. Not only is poisoning inhumane but it rarely works in the way that you want it to. The poison can be eaten by other innocent animals or by your pets or a poisoned muskrat can indirectly poison another animal if it is eaten. Not to mention that a poisoned muskrat can go to a very hard to reach place to die that will cause a stench and possibly even poison the water supply. It is best not to use poison, and if you do, use it as the very last resort. There are also a variety of repellents on the market that claim to get rid of muskrats. These are usually chemical sprays or predator urine scents that you put on or near your property. The best repellents to use are predator scents like fox, coyote or snake and taste repellents like garlic, onion, cayenne pepper, etc. However, be aware that these are not guaranteed to work as it might not deter the muskrat and they have to e reapplied constantly to keep the scent fresh. You will find that you will spend lots of money without a lot of result. About Mustrats - Muskrats are medium-sized rodents that live both in water and on land which means that they can be found in almost any temperate climate that has easy access to a water source like a lake, pond, stream, river, reservoir, etc. This critter lives and makes its home in the sides of water banks where they have easy access to the water, but can also make a quick getaway in some brush on the land. Muskrats eat a very strict diet of plants and vegetables that can be found near their burrow. Muskrats are also nocturnal animals so you often see the damage that they do rather than see the animal itself. However, because of their eating habits and the places where they make their homes, they are almost universally seen as pests rather than harmless rodents. Learn some additional tips on my How To Get Rid of Muskrats Yourself page - more muskrat removal tips and methods. While muskrats in a private or decorative pond can cause problems, these little animals are destructive on a larger scale when they invade public reservoirs or flood dikes. Muskrats will create a lodge above the water, but their dens and burrows extend into embankments. The constant tunneling can damage dikes and can create a serious issue when flood walls become compromised. Getting rid of muskrats in the water is most effectively done with humane, lethal traps. Body gripping traps can be set almost anywhere near a muskrat lodge. The best places for setting up the traps are in or along the muskrat runs. Like other semi-aquatic animals, muskrats travel the same pathways over and over, creating an obvious path through the vegetation and mud. The muskrat will continue to travel these paths even in winter. Setting up a body gripping trap in a location of frequent activity will give you the best chances of making a catch. Check the traps daily to make sure they are set properly and that no animals are caught and suffering. Trap location is not the only important factor; water level and animal size should be considered. Muskrats are semi-aquatic rodents which basically belong to regions of North America. The name muskrat came about because of an odor very similar to musk which they use to mark their territories and because of their rat-like appearance. The adult muskrats can grow 16 to 24 inches in length and weigh 1.5 to four pounds. Their body is covered with a coat of thick fur. The coat of fur has two layers to protect them from cold during the winter season. Their tail is long and has scales instead of hair which aids them in swimming. While they walk, their tail is dragged on the ground leaving a mark which is used to recognize and track them. They are well suited to live on the land as well as in water areas; however, they prefer to spend much of their time in the water. Their feet are semi-webbed and they have a unique ability to close their ears in order to prevent the water from entering inside. They can stay or swim under the water for about 12 to 17 minutes at a time. Muskrats are nocturnal animals are very rarely seen during the day time. They like eating aquatic vegetation with cattails being their favorite. They do not store food but do eat the inside of their own lodges or steal the food stored by beavers that they even share homes with. They also eat frogs, fish, turtles and mussels. Muskrats are known to live in small families which generally consist of a pair of male and female and their offspring. They are known to mark their territory and fight with other muskrats in order to protect it. They make nests in streams, lakes or ponds which protects them from predators and the cold weather. The entrance of the nest is six to eight inches wide and is submerged in the water. Usually vegetation and mud is used to make the lodge. In snowy areas, vegetation is used to close the opening of the lodge and is replaced each day. They are native of North America but are also found in Europe, Asia and South America. The gestation period for a muskrat lasts from 25 to 30 days. Female muskrats give birth two to three times in a year. Each time up to six kits or young ones can be born. If the conditions are favorable, they can give birth as many as six times in a year. Kits are blind and hairless at the time of birth and cared for about eight months by the mother. They start swimming when they are 10 days old and begin to eat after another 10 days. Before they get sexually matured and are ready to mate, they spend their time in burrowing and making their own house which will eventually be used to raise their kits. They attain sexual maturity at six months of age and they start seeking females to mate with at that time. In the cold areas, they take twelve months to attain sexual maturity. The mating period lasts from March to August in cold areas while in other areas they may breed throughout the year. Fights with other males to seek potential female mates are quite common. 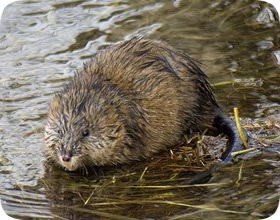 Muskrats are known to cause Tyzzer’s disease and Tularemia. While the chances of humans catching Tyzzer’s disease are really slim, pets including dogs may suffer from it. Symptoms of Tularemia include headache, fever, chills, cough, muscle aches, weakness and pneumonia. Muskrats can cause severe damage to crops and vegetation. The burrows made by them may destroy the roots of the plants and trees causing severe damage. These are the main reasons peoople seek muskrat removal. They also dig burrows inside homes. If tunnels are made near the supporting structure of buildings, then serious damage to the entire structure may occur. The tunnels made by time have also resulted in leakage of stored water in the past.